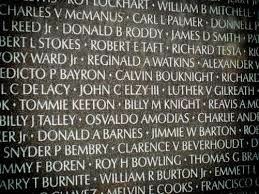 Do you know the story of the Vietnam Veterans Memorial? It is a solemn, beautiful work of architecture, that aims to honor the service of the soldiers who served, while refraining from glorifying war or taking a political stand. A few months ago, I learned that it is also the vision of a single man. Jan Scruggs was a teenager when he served in Vietnam. A number of years after he came home, he and his wife went to the movies to see "The Deer Hunter," the celebrated 1978 film about a trio of steelworkers and their service in the War. When Jan came out of the theater, he told his wife that he was going to memorialize his fallen comrades by building a monument in their honor in Washington DC. He had no money, no political or fund raising knowledge or connections. He started with only $2,800 of his own money. He personally went door to door until he convinced a handful of senators to support his cause. He eventually raised over $8 million for the project, mostly from private donations. In 1981, at the age of 21, Maya Lin, a Chinese-American Yale senior, won the public design competition for the Vietnam Veterans Memorial. We think of it as perfect and inevitable, but at the time, there was outrage and opposition, because the award went to: a woman, a college student, an Asian-American, and because the design did not match what most people thought a war memorial should look like. The monument consists of a low, black cut-stone masonry wall, with the names of 57,661 fallen soldiers carved into its face, listed chronologically, by the date they died. And I thought about the power of a single person to make a profound difference when I came across the work of another Yale student, a masterful essay titled "The Opposite of Loneliness." Marina Keegan wrote this piece for a a special edition of the Yale Daily News at the 2012 Commencement exercises. Five days after she graduated, she died in a car accident. The essay went viral, receiving 1.4 million hits in 98 countries and transforming her into an icon for her generation. I was privileged to read it, two years after it was written. I am grateful for people like Jan Scruggs. I am grateful for the Internet which gave me the gift of Marina's words.